The first moments of a new baby’s life are precious beyond words. A tiny newcomer joins a family, a community, the world. The joy is forever etched in the hearts of parents, grandparents and young siblings. Winchester Hospital is thrilled and honored to be a part of that experience for the 2,200 babies who take their first breath here each year. 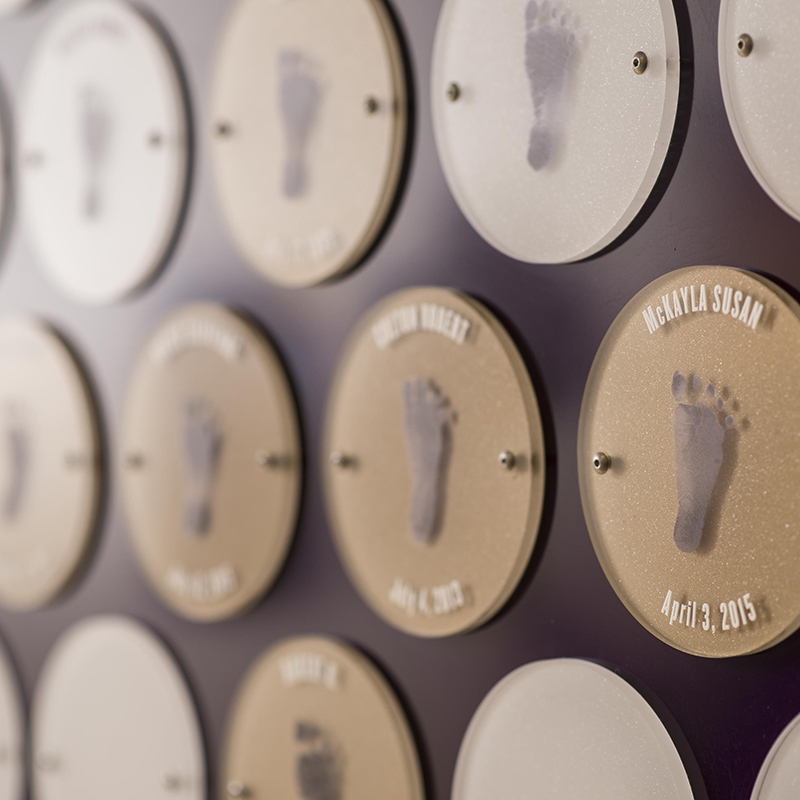 To celebrate the exciting occasion, families are able to make a gift through the First Steps program at the hospital and etch their newborn’s name onto a gold or pearl footprint plaque displayed on the Donor Wall outside the Mother Baby Unit. First Steps plaques are the perfect way for families to commemorate a most special day. Some families have called it their very first birth announcement! And siblings may share in the honor with a plaque of their own. Importantly, the funds act as a gift to future babies, creating enhancements to care in the Mother Baby Unit and Special Care Nursery. First Steps pays it forward for generations of the littlest patients. “We even had grandparents who invited baby shower guests to contribute towards a plaque,” said Geri Wilson, Nurse Manager. “Their grandchild had arrived early and spent a month in our Special Care Nursery. The group gift was in gratitude for that care.” There are beautiful stories behind each one of the First Steps plaques. Winchester Hospital has a longstanding reputation for providing the highest quality and most compassionate maternity care, including prenatal, birthing, postpartum, breastfeeding and more. New investments in this area support important enhancements. Improvements to the family waiting area, offering a comfortable space for families during an anxious and exciting time. Expanded access to the hospital’s innovative “Baby Box” program, allowing all babies born at Winchester Hospital to go home with light, portable infant sleep surface designed for safe sleep. Winchester Hospital’s First Steps Program raises funds for enhancements to the Mother Baby Unit. 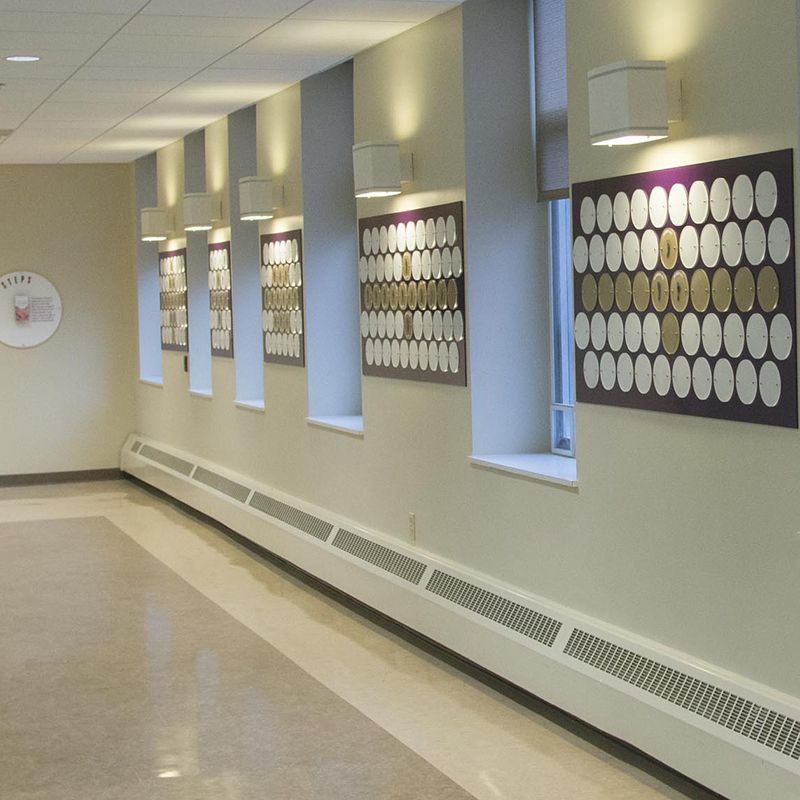 First Steps plaques line the hallway leading to the Mother Baby Unit. Gold and pearl plaques honor newborns. Want to honor a baby in your life with a First Steps plaque? Please contact Nancy Breton at 781.756.2158 or Nancy.Breton@Lahey.org.